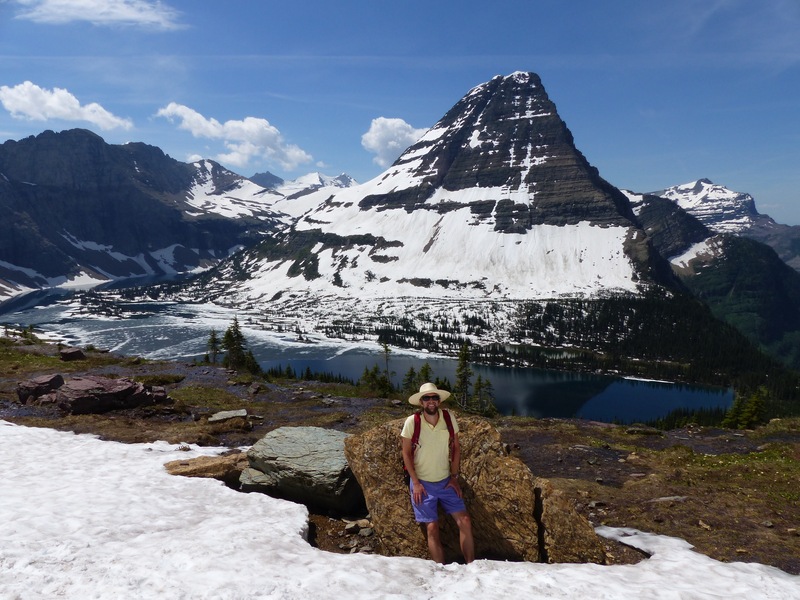 When we finally dragged ourselves away from our dream town, Missoula, livers and calorie intake both having taken a beating, it was time to get back to the wholesome life. Destination: Glacier National Park. If you’ve never heard of Glacier, I don’t blame you. Neither had we, until we started doing the camping circuit, and people kept asking us if we were going there. Much like Big Bend, we figured there must be something in it, so we decided this would be our last National Park hurrah in the west before starting the journey back towards Virginia to catch our flight in August. In the north-west of Montana, on the Canadian border, Glacier is often referred to as the jewel of the Rocky Mountains. A fantasy landscape of towering mountains, frozen glaciers, and crystal clear lakes, it made us question again when this country will stop surprising us. The water throughout Montana is incredibly glassy, but here the lakes and rivers are lined with colourful rocks and pebbles, which make for the kind of scenery I thought had been lost forever. Pulling into Agpar Campground, a couple of days before the 4th July weekend, we were dubious as to whether we would get a spot. Luckily, the National Park campground is first-come, first-served, and we snagged the last site on the loop, with the campground host telling us it was the only decent spot left in the whole campground (of 400 or so). Surveying the site, we pondered that recommendation. 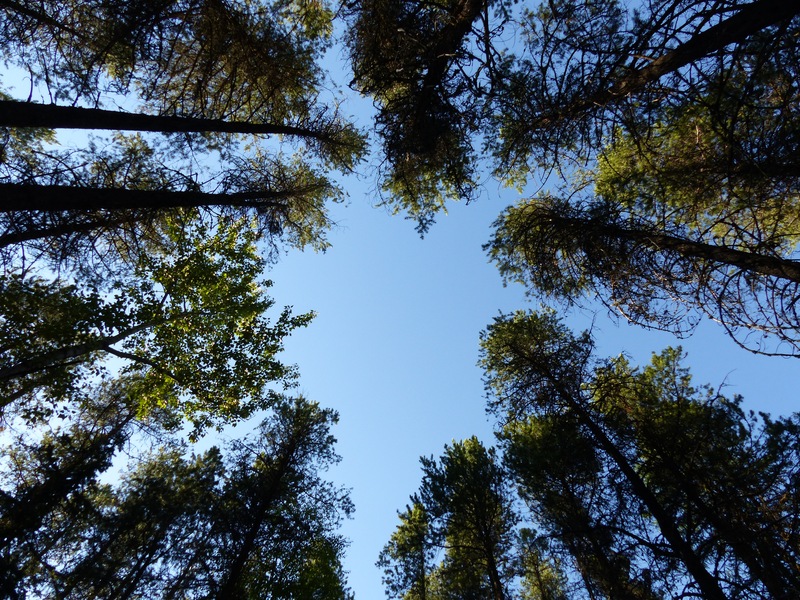 Tall pine trees lined either side of the curved pull-through. The gravelly ground sloped in every direction. We were right next to the toilet block, and the bins. Dreamy. 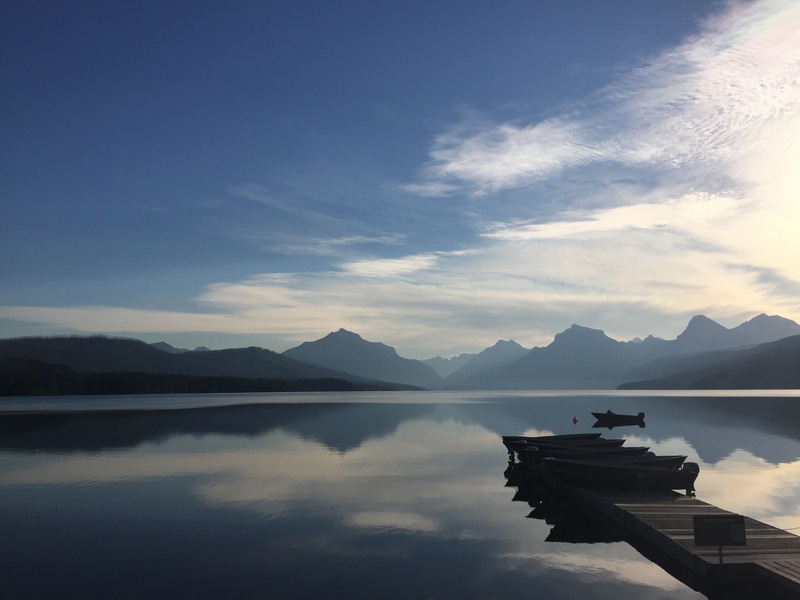 But this was our dream – a spot in Glacier, for one of the busiest camping weekends of the year, and come hell or high water, we were getting our trailer into it. Hindered by a fascist one-way system which left our door on the wrong side and us walking out into the camp road, John nevertheless manoeuvred back and forth, in between the trees, assisted by me shouting things like “watch the tree”, so that our slide could come out, but our doors could still open (no mean feat as it turned out). We then had to deal with the slope. We have a set of what look like giant orange Lego blocks, which we can place under the stabiliser jacks (collapsible legs at each corner of the trailer), but even with all of these deployed, we were still woefully wonky. That’s not ok in a trailer (John will explain, it’s something to do with the fridge, and generally rolling out of bed I guess), and we were certainly not anywhere near buying any more. So instead we improvised, and got the trailer happy by shoving firewood under her legs. Dreamy, as I said. We had a discussion about length of stay. 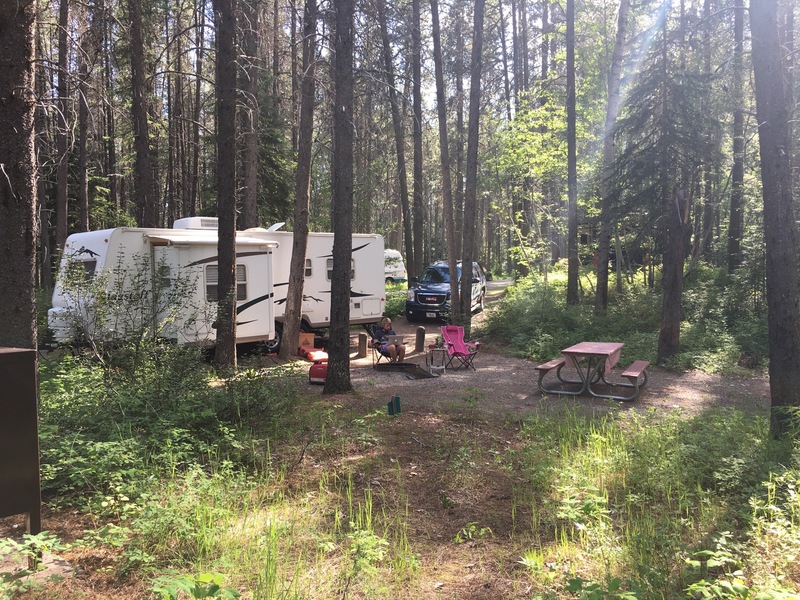 It was Wednesday and, with Independence Day on Monday, we did not want to be on the hunt for another campsite, having, as normal, ignored all warnings and failed to make reservations. 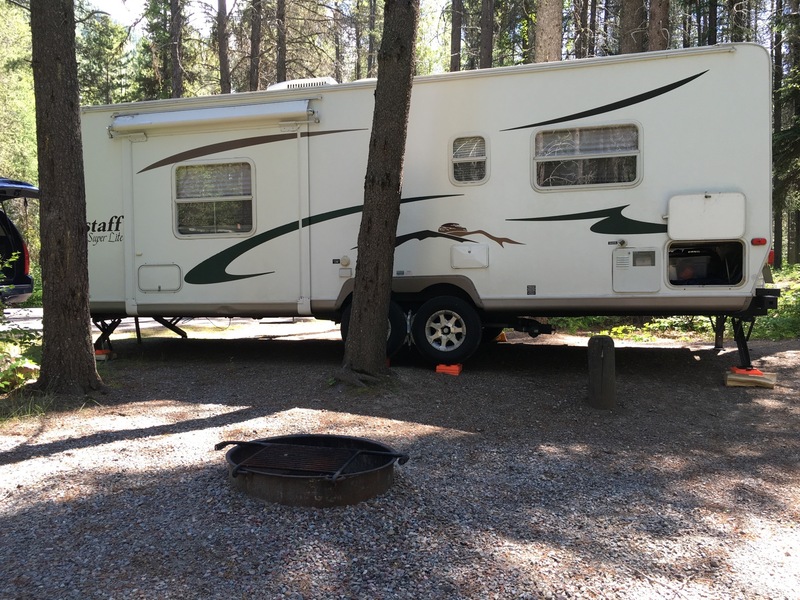 So we decided to try an unprecedented 6 nights in a campground with not only no hook ups (water, electric, sewer), but also no showers anywhere. We (‘we’) can refill our fresh water tank in situ, with a collapsible 5 gallon container, but the main issue in these dry camping situations is our grey tank i.e. the tank that holds all the water once it’s dirty – from washing dishes, showering etc. Previously, we’ve done 3 nights, but that was in a site with showers, where we could at least get clean without dumping a whole load of water into our tanks each day. Here’s where my personal challenge began. I have a thing about washing. At home, I like to bathe every day (I may have mentioned this before..! ), and often twice a day. I normally wash my hair every other day, occasionally every third day, but I can’t bear being at work with greasy hair. So for me to contemplate and, dare I say it, relish the challenge of sticking this out for 6 nights, already felt like a step change. John has no issue with it. He’s a scout at heart and would frankly have done this year in a tent, were it not for his neurotic and bug-fearing wife (did I mention the campsite was under trees? Yes, in a forest. And we know what that means…). And yet we prospered. I surprised John but moreover myself by adapting to this life of enforced water-monitoring. I developed systems like using our fruit bowl to wash dishes in, disposing of the water in the camper’s sink, and implemented a regime of nightly washes, using the big red bucket stored in John’s ‘blue job stuff’ under the trailer. Yes, I was washing out of a bucket, and I couldn’t have been happier. And there weren’t even any bugs! Obviously there was a pay off. The camp site we had was peaceful, and large, with a big picnic area and a fire ring. Being close to the restrooms was actually a bonus, as we could easily use the toilets and sinks in there without using up our capacity. They felt like an extension of our home by the end of our time. Each night, we would come home from exploring the beauty of the park, light a fire, have a beer, make some dinner, chat, read, relax, bucket wash, and then go to bed when the light faded, not until at least half ten. It’s the kind of cliched ‘simpler’ existence that people tend to talk of when they go and ‘find themselves’. Embarrassingly enough, it seems I am found. I have the kind of mind that works overtime. If I am awake at night, I am often mulling things over, worrying, rehashing the day. In the day, I go over what I’ve said, what I’ve done, what other people have said and done, in the hope I’ve not been misunderstood, haven’t upset anyone. That sort of thing. John doesn’t. He’s got a very peaceful mind. It’s one of the reasons I married him. But here, in this outstanding country, in this wilderness, out on the trail, I have found peace. My voices quiet, the worries go away, I am absorbed in the landscape and the sounds and the wildlife. I hope to come to understand how to bring that peace back with me when it’s time for this adventure to end, but for once I am not worried about this; I am hopeful, I feel I have inner resources that were either not there before or of which I was unaware. We feel lucky every day. 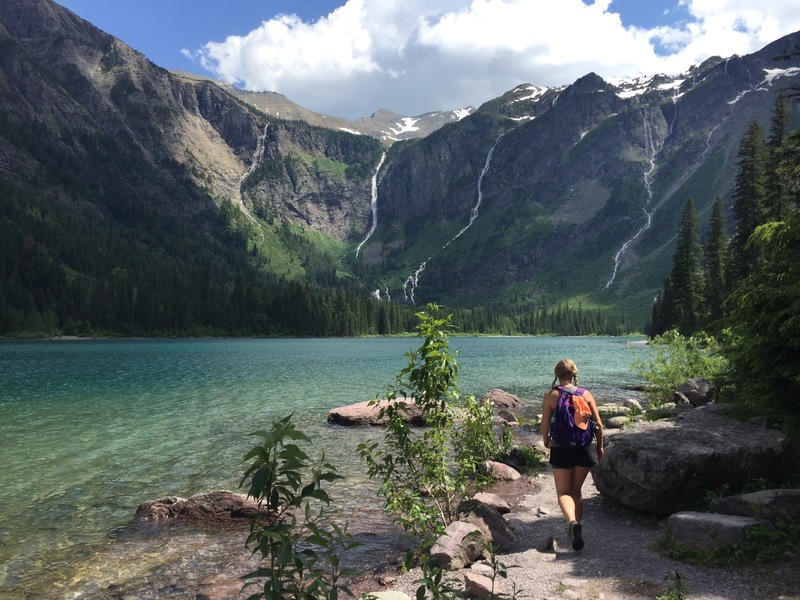 In Glacier, we hiked around lakes so clear and blue you’d think you dreamed them. If you’d asked a year ago me if this picture would be me, I’d have laughed. I have my hair in plaits because it’s not been washed, I am wearing shorts and sensible hiking shoes. And I am totally happy. One day we hiked over a snow pack to reach another lake. Looking at John bounding ahead of me, legs sticking out of his shorts and straight into ankle deep snow, I had a moment of “Oh, what have I let myself in for” but I hauled myself up the mountain behind him, feet cold but body hot, imagining my bath at the end of the day (“imagining”! ), and reached the overlook. It was worth it for the view – a deep blue lake, half covered in ice, reflecting the mountain above. 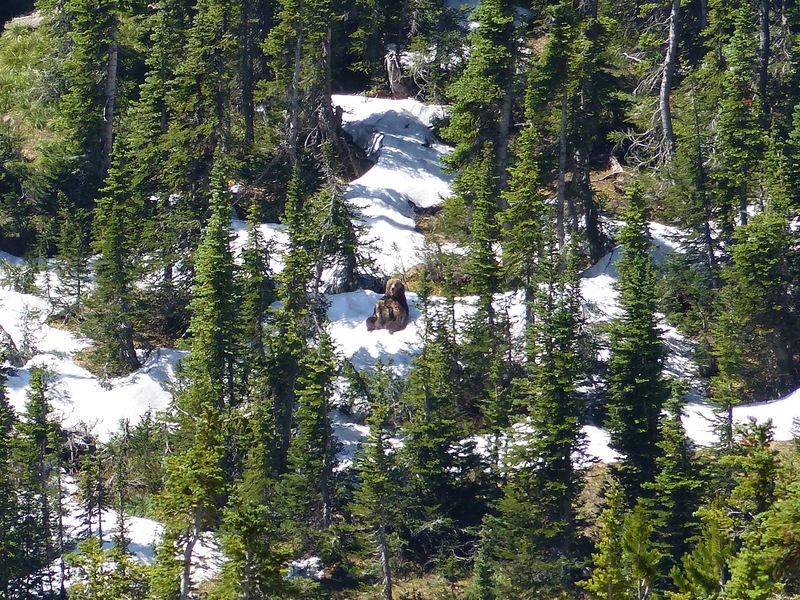 A ranger was perched at the start of the trail down to the lake, advising that it was now closed due to bear activity. This was a blow, but we sat down on some rocks with some fellow hikers, who were looking through binoculars at something. “Have you seen them?” the lady next to me asked, handing me her pair. John grabbed ours. Looking through the lenses, we witnessed a beautiful sight – a female grizzly bear with her cubs, nursing them and playing with them in the snow on the shore of the lake below. It was an astonishing moment and I was pleased that with the trail closed, she would have this time and space with her babies, observed only from afar by a group of very happy nature geeks! We meet some lovely people and see some fabulous things. A couple of girls pointed out to us the mountain goats, well camouflaged but visible on the craggy rocks of the mountain. A couple of marmots gave us a show, play fighting and chasing one another. 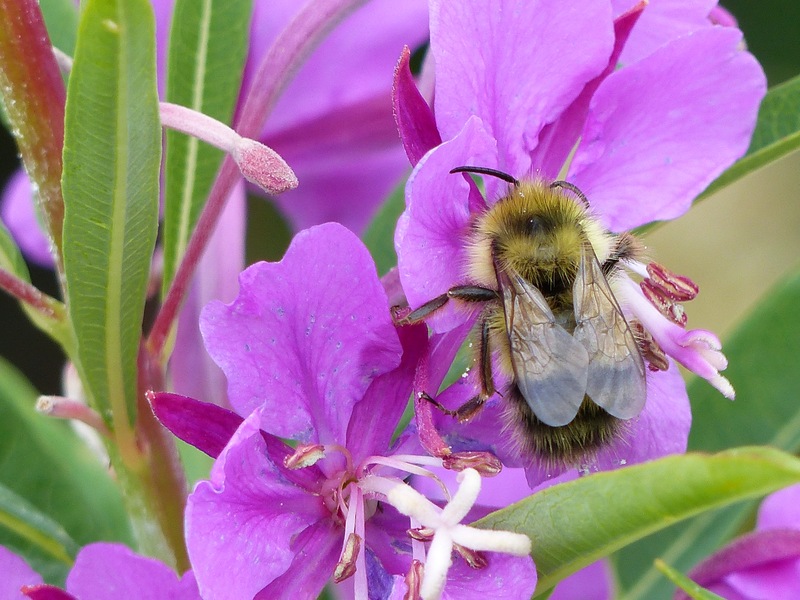 And I was on the look out for bees and butterflies on every trail, as I’ve been writing a piece for John’s sister Lorna, on the need for wildflowers in the UK (see here for shameless plug). The time and space we have here is unparalleled and it’s led me to enjoy and value things I took for granted at home (like my bath!). We’re lucky to live in a rural area, and to have my folks in Cornwall, so when we are back we will be able to spend as much time as possible getting outside, and trying to maintain some of the peace we’ve found in wandering. There will, however, be nothing on the scale of these mountains. 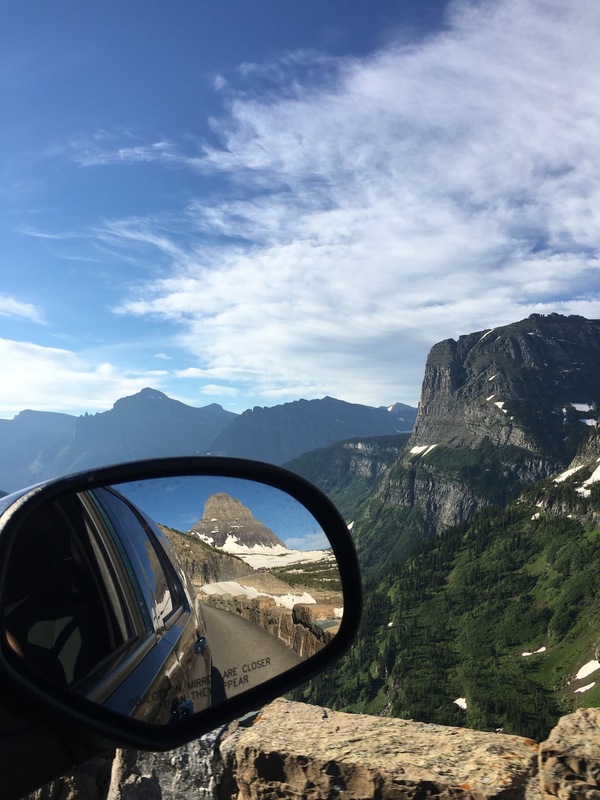 Aside from the hiking, we loved the driving in Glacier. 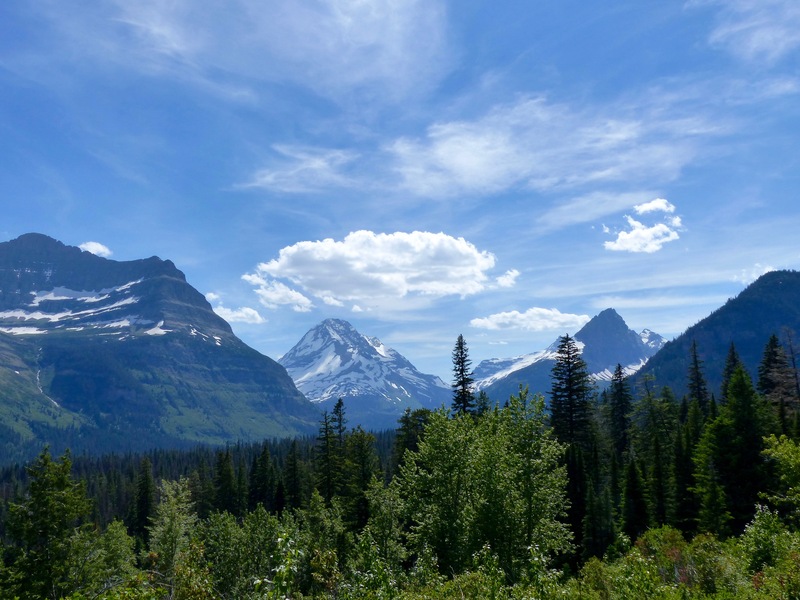 It’s another huge park, and is bisected by the famous Going-to-the-Sun Road, a twisting, turning, mountain road, perched on steep drop-offs and lined with low overhangs. Waterfalls cascade along it, there’s even a stretch called the Weeping Wall, where water flows right on to the road, and if you’re someone with her camera poking out regularly, right into your car. It takes time, but we had time, so two hours drive to start an 11 mile hike was actually ok. It wasn’t as though I had a long, hot soak to fit in that evening. When our 6 nights were over, I felt a kind of sadness, like I wasn’t ready to leave this wilderness. Fortunately for me, but not my hair, the next three nights were spent in similar conditions, first in a rest stop in the middle of Montana (one of the nicest free spots we’ve had and a lot nicer than most private campgrounds), and then at the Devil’s Tower in Wyoming. I might write about this another time but suffice to say for now it only enhanced my peaceful mind. On day 11, we reached the deserts of South Dakota – not somewhere you want to be in a metal box with no air con, so we did return to electric and water hook ups for a couple of nights. Walking into the gleaming new shower rooms at the campsite, I saw they had painted on the wall a phrase: “Dream, believe, discover”, which was very apt for how I felt right then. We had dreamed of this life, but I don’t know if I truly believed I could live it. What I’ve discovered is that I can adapt better than I thought, and put aside my creature comforts, to enjoy what is on offer here in these unique (and I don’t use that word lightly) wonderlands. I do, however, still love the feeling of clean hair, so that, a pizza and a drive in movie that Saturday felt like a date night of luxuriously epic proportions! Guest (ale) column: Missoula - America’s best kept secret?